Go on the ride of your life when Jeeping and ATVing in Israel with Israel Extreme! 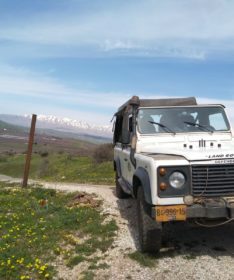 We arrange Jeeping and ATVing tours in all areas of the country: in the Golan, the Galilee, the Judean desert and the Negev. We make sure to use the highest equipment on the market as well as our professional staff. We take pride in our perfect safety record and can accommodate a wide range of ages! We custom tailor each tour to make this a wonderful option for groups with young children and anyone who wants to have an exciting and unusual adventure without a great deal of physical exertion.We also cater to older participants and people with disabilities. Jeeping and ATVing in Israel with Israel Extreme is the best way to see off the beaten track sites! It leaves your adrenaline pumping and “Wows” the whole group! If you’re a Jeeping junkie or ATVing enthusiast we have created the ultimate joyride for your touring adventures. When ATVing with Israel Extreme, we don’t hold back! We are prepared to go where regrets can’t follow and drive deep into the wild side of this country. ATVing will leave you speechless and then turn you into the greatest storyteller among your friends and family. Whether you are looking for a Jeep tour full of fun and adrenaline or an educational Jeep tour of a historical and/or cultural site, you just name it and we will provide it! So when planning your week remember to eat, sleep, jeep and repeat. We take pride in our perfect Safety Record.